The fibers in our carpet are different. Our multidimensional fibers are specially designed for beauty and performance to create the stunning carpet styles that INVISTA's STAINMASTER® carpet is famous for. So how do you protect the beauty of these specially designed fibers from soil and stains - without sacrificing the soft luxury and style of STAINMASTER® carpet? 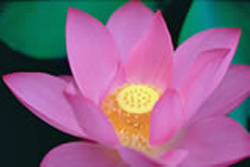 The self-cleaning quality found on the leaves of the lotus flower became our inspiration. By mimicking the lotus leaf's ability to prevent soil particles from sticking to its surface, our specially designed LotusFX™ Fiber Shield technology makes it difficult for soil to stick to the carpet fibers, helping to keep STAINMASTER® carpets up to 30% cleaner and lasting up to 50% longer than other carpets. * Plus, most liquid spills bead up on the carpet fiber's surface making it difficult for them to penetrate. Together this works to make STAINMASTER® carpet easy to maintain and allows the carpet to keep its stylish beauty year after year.